DTBat® is a self-working System that detects bat presence in real-time, and takes automatic actions linked to bat detection. Bat Mortality Reduction through automatic actions. 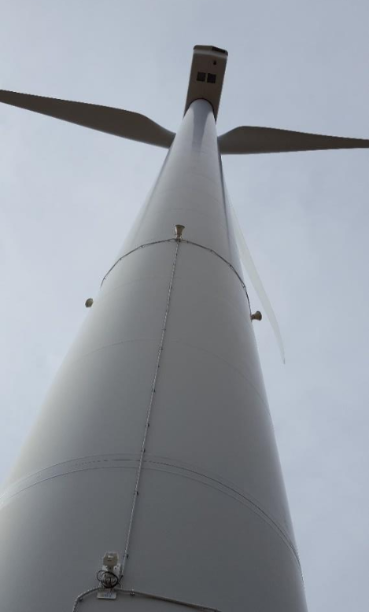 For the Wind Industry, DTBat® System automatically survey the airspace around Wind Turbines (WTG); and optionally, reduces the collision risk triggering WTG Stops linked to real-time bat activity and/or environmental variables. DTBat® System stores recordings of every bat pass detected (sonogram) and the action taken. DTBat® Clients have access to the DTBat® System recordings through an online Software Application named DTBat® Data Analysis Platform (DAP). DTBat® Detection Module surveys the airspace with Bat recorders, detecting and recording bat passes in real-time. Installation design and operational settings are customized for any Target Species and WTG dimensions. DTBat® Detection Module is equipped with 1 to 3 Bat recorders installed at height on the WTG tower and/or on the nacelle. Recorders are placed in specific locations to achieve the best surveillance of the moving blades area. DTBat® Stop Control Module automatically Stops and restarts WTG according to bat activity detected in real-time and/or environmental variables. Stop trigger and Stop duration criteria are adjustable to target Species or to cover a % of the total bat activity detected (e.g WTG stopped for 95% of the bat activity detected). DTBat® DAP is a complete online Software Application to provide transparent access to review bat sonograms, environmental data and WTG operational parameters. Graphics and Automatic Service Reports for selected periods are also available. Includes three access right levels: Analyzer, Viewer&Reporter and Viewer.